Manuel Gómez-Moreno González (1834–1918), Salida de la familia de Boabdil de la Alhambra (Departure of the Boabdil Family from the Alhambra) (c 1880), oil on canvas, 250.5 x 371 cm, Museo de Bellas Artes de Granada, Granada, Spain. Wikimedia Commons. Here in the UK daylight is now brief, the weather often grim, so I think it’s time to head off for a long weekend somewhere lighter, warmer, and less glum: this weekend we’ll go to Granada, in Andalusia, southern Spain, and visit the Alhambra there. 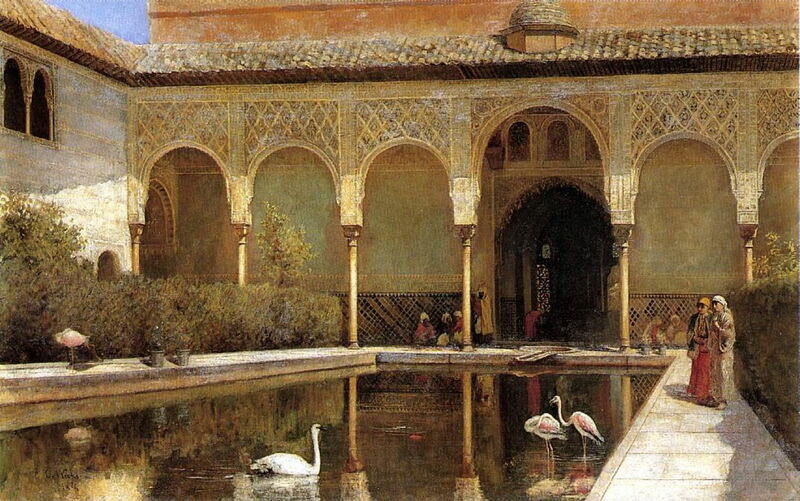 In this first of three articles about paintings of the Alhambra, I’ll trace some of its history. The next two will consider more general views of the palace complex. The Alhambra is one of the oldest, grandest, most fascinating and beautiful palaces in Europe. It started as one of many Roman hill forts, which had been used in a series of campaigns to control a succession of tribal revolts, and stamp the Empire’s presence close to North Africa. It was rebuilt in 889 CE, but nothing palatial became of it until around 1250, when the ruling Nasrid emir started to turn it into something much grander. At that time, much of the south of the Iberian peninsula wasn’t ruled by people from Europe to the north, but Muslim dynasties who had swept up from the south. The Emirate of Granada was the last substantial part of Iberia to remain under Muslim rule, and in 1333 the Sultan of Granada, Yusuf I, decided to transform the Alhambra into a royal palace. In doing so, he and his successors built one of the most exquisite expressions of Arabic Muslim art and architecture along a ridge about half a mile (0.7 km) long overlooking the city of Granada. 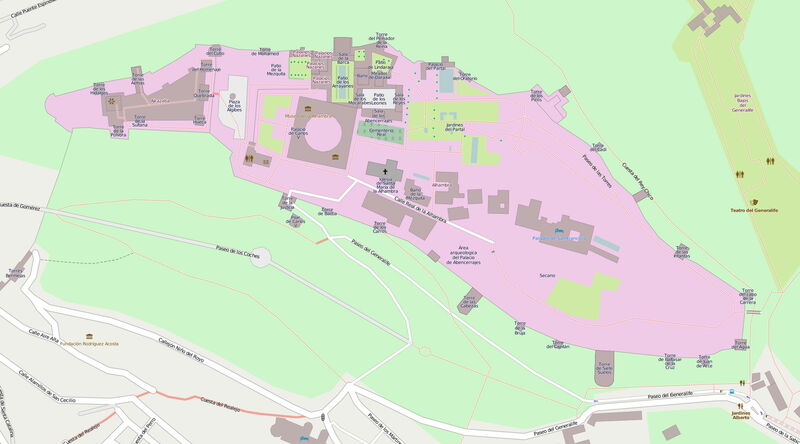 Openstreetmap and contributors, Map of the Alhambra, Spain (2013). © OpenStreetMap contributors, via Wikimedia Commons. This plan from Openstreetmap and its contributors shows the modern site, as of 2013. Constantin Uhde (1836–1905), Plan of the Nasrid Palaces, Alhambra (1892), illustration, further details not known. Wikimedia Commons. 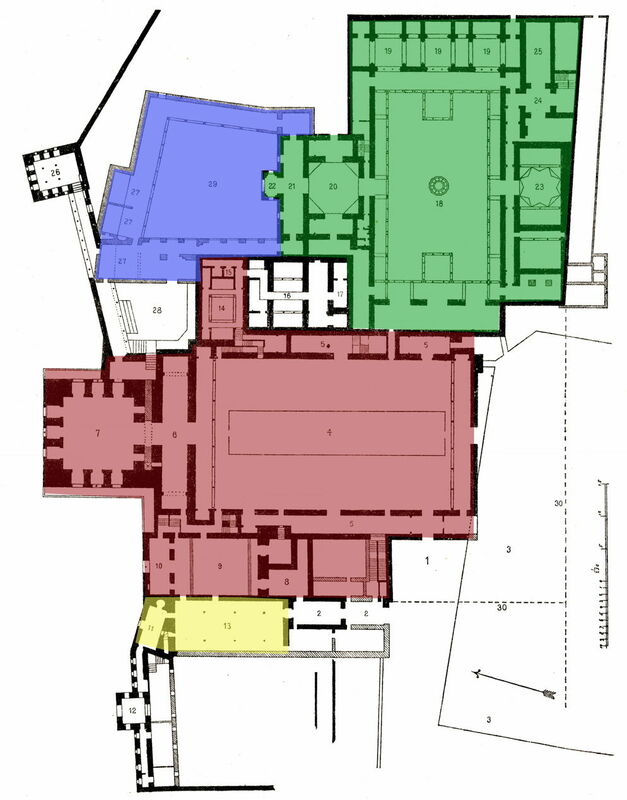 Red is the site of the Palace of Comares and the Palaces of the Ambassadors. Green is the Palace of the Lions. Blue is the Garden of Lindajar and later quarters of the Emir. Edwin Lord Weeks (1849–1903), A Court in the Alhambra in the Time of the Moors (date not known), further details not known. Wikimedia Commons. A few paintings have tried to imagine how the current remains of these Nasrid palaces would have looked in their heyday between 1350 and 1492. Among them is Edwin Lord Weeks’ undated view of A Court in the Alhambra in the Time of the Moors. Weeks was a noted Victorian painter of Orientalist views. 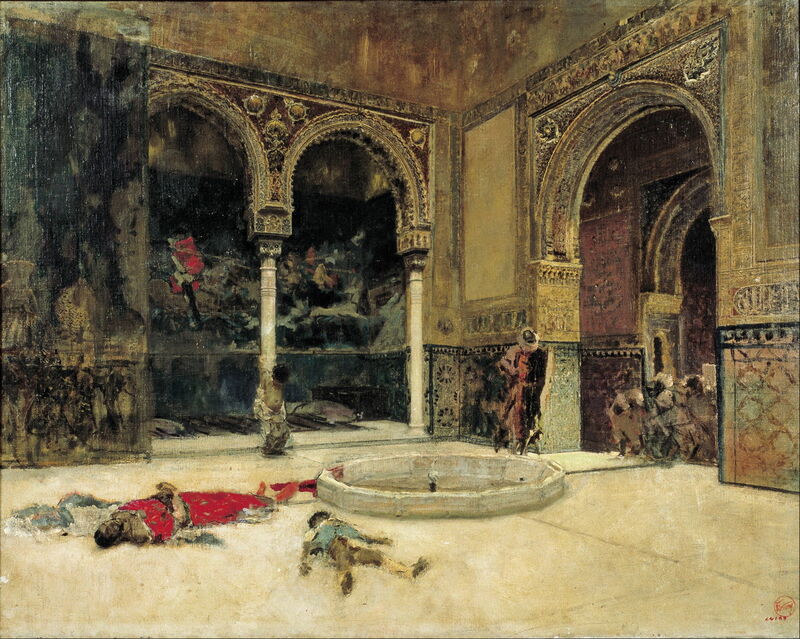 Marià Fortuny (1838–1874), The Slaying of the Abencerrajes (c 1870), oil on canvas, 73.5 x 93.5 cm, Museu Nacional d’Art de Catalunya, Barcelona, Spain. Wikimedia Commons. There are several legends associated with the Moorish period before 1492. When Marià Fortuny moved to Granada in 1870 or 1871, he told one of those in The Slaying of the Abencerrajes (c 1870), dating from the early 1400s. At that time, the two major family dynasties who were competing for power in Granada were the Abencerrages or Abencerrajes, and the Zegris. One of the former family fell in love with one of the royal court, and was caught trying to climb up to her window. The king flew into a rage, ordered the whole family to be confined in one of the most beautiful courts of the Alhambra, where he had them killed by the Zegris. Fortuny shows their bodies littering the floor of that court. Another grim vision of events of that era is Henri Regnault’s (in)famous Summary Execution under the Moorish Kings of Grenada from the same time, 1870. This shows the immediate aftermath of a summary beheading performed on the steps of the Alhambra. Regnault’s use of contrasting colours makes the spilled blood seem intensely red. The low angle of the view also enhances the stature of the executioner and gives the scene immediacy. While much of the rest of Europe was engaged in the futile succession of Crusades in the Middle East, the Iberian peninsula underwent its own traumatic and bloody ‘reconquest’ to evict the Moors. In the 1480s and early 1490s, a largely guerilla war was waged by the forces of the Reyes Católicos, King Ferdinand II of Aragon and Queen Isabella I of Castile, which led to the surrender of the last Nasrid sultan, Muhammad XII of Granada (known locally as Boabdil) in 1492 – a defining moment in the history of modern Spain. 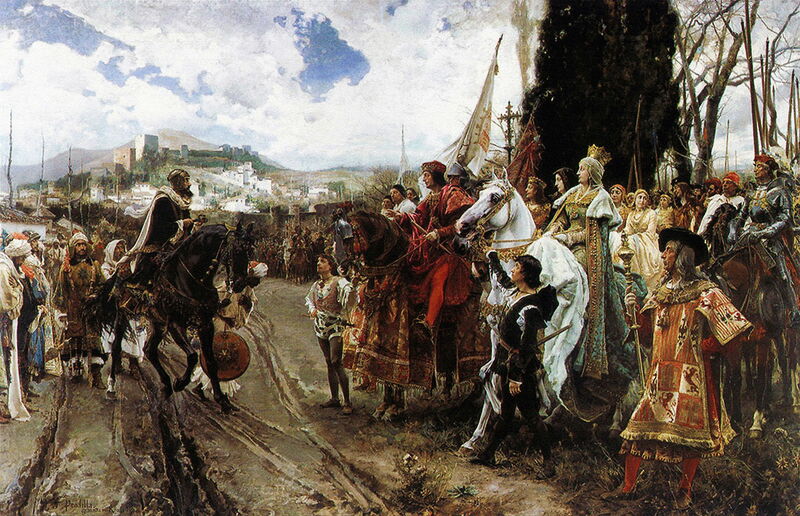 In 1879, Francisco Pradilla Ortiz was commissioned to paint La Rendición de Granada (The Surrender of Granada) by the Spanish Senate, which he finally completed in 1882. 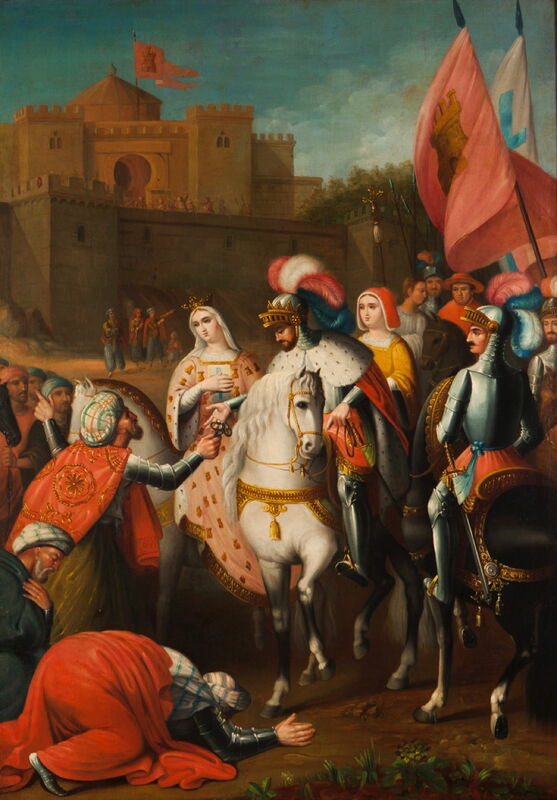 Muhammad XII is mounted on the left, holding the keys to the city, which he is about to hand over to Ferdinand II, whose hand is already reaching out to receive those keys, and Queen Isabella I on her white horse. Apparently Muhammad was spared the ignominy of having to kiss the royal hands, and was allowed to simply hand the keys over. Dominant in the background is Muhammad’s palace, the Alhambra. The detail below shows Muhammad. Francisco Pradilla Ortiz (1848–1921), La Rendición de Granada (The Capitulation of Granada) (detail) (1882), oil on canvas, 330 x 550 cm, Palacio del Senado de España, Madrid, Spain. Wikimedia Commons. Following on from La Rendición de Granada, Pradilla painted El Suspiro del Moro, or The Moor’s Sigh. The two paintings seem to have been started at about the same time, in 1879, but he took another decade to finish this after he had completed the Surrender. This shows the legendary sequel: after Muhammad XII had surrendered Granada, he is claimed to have ridden up to a rocky viewpoint from where he could take a final view of the Alhambra and the valley of Granada: the location now known as Suspiro del Moro. 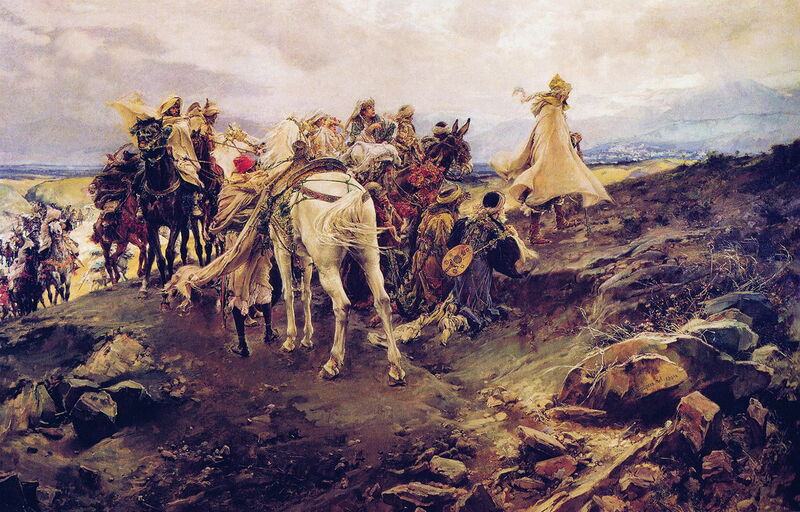 For a while, Muhammad remained in exile in Las Alpujarras, but soon crossed to Fes in Morocco. Pradilla shows the former ruler dismounted, after he had walked over to take his last look at Granada in the distance. Although this was painted in oils, the hills behind Granada appear as if they had been painted using watercolour washes – an unusual effect demonstrating his great technical skills. Vicente Barneto y Vazquez (1836-1902), The Capitulation of Granada (date not known), further details not known. Wikimedia Commons. Pradilla is by no means the only artist to have painted this great historical moment. 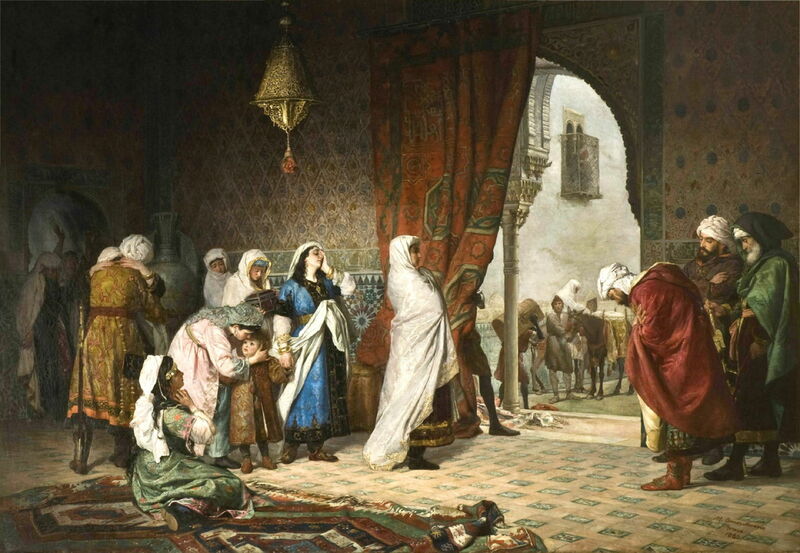 Vicente Barneto y Vazquez’ undated version is The Capitulation of Granada above, and shows the moment that Muhammad handed over the key to Ferdinand. Wonderful though Pradilla’s paintings are, I have a liking for the more human story told in Manuel Gómez-Moreno González’ Salida de la familia de Boabdil de la Alhambra (Departure of the Boabdil Family from the Alhambra), which was completed at about the same time, in 1880. Here is the royal family and its entire retinue packing its bags and setting off for wherever destiny would take it, leaving this magnificent complex of palaces. Tomorrow I will show more of those buildings, their gardens, and surroundings. Posted in General, Life, Painting and tagged Alhambra, Barneto, Fortuny, González, history, painting, Pradilla, Regnault, Spain, Uhde, Weeks. Bookmark the permalink. Thank you for the interesting post. 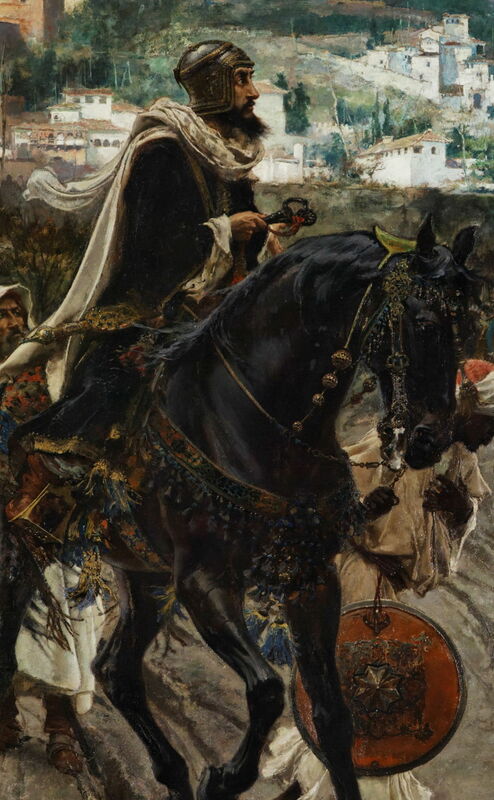 Here’s another painting you might enjoy, Eduard Charlemont’s The Moorish Chief. http://www.philamuseum.org/collections/permanent/102792.html?mulR=405282654|1. Charlemont never visited the Alhambra; the scene is from his imagination and the figure was a posed model. Of the 300,000 works in our museum’s collection, this image is our most frequently sold poster. Charlemont definitely got something right. Thank you so much for posting that link. I wonder if Charlemont had seen some of the books and prints of the interiors of the Alhambra? It’s a magnificent painting, most of all because, unlike a lot of Orientalist works, it gives its subject great dignity and respect. Charlemont did study ‘the Orient’ and chose this subject, so popular at the time, to submit to the Salon of 1872. It worked – it received ‘an honorable mention’. He also chose to paint it on a wood panel to make every detail exquisite. It’s large, and the noble figure draws visitors to him, and yes, how wonderful that he commands dignity and respect.